Aloe vera gel is an ayurvedic cream for dry skin that keeps skin’s surface soft and moisturized and prevents formation of lines, wrinkles and looseness in skin. Aloe Vera gel has been used since ancient times for treating skin conditions and improving skin tone and tightness. This gel comes with certain powerful properties which make it an exquisite herbal supplement for enhancing health and attraction of human skin. Aloe Vera cream has been designed which supplies all the natural properties of this tremendous herb in the form of ayurvedic cream for dry skin. Skin collects blemishes when it becomes dry by losing its moisture, it can be due to harsh conditions like scorching Sun, lack of nutrition to skin or due to cosmetic creams etc. Aloe Vera cream is herbal pure Aloe Vera gel supplement which keeps skin healthily moisturized and healthy and free from skin conditions like acne, eczema, rough patches etc. effectively. Herbal pure Aloe Vera gel cream seeps into skin and open-up skin pores, this prevents sebum build-up beneath skin and also keeps skin’s surface soft and moisturized. Proper flow of sebum prevents acne and dryness of skin. Herbal pure Aloe Vera gel possess anti-bacterial properties and supplement nutrition to skin which keeps it tighter by promoting faster cell generation. Faster cell generation prevents formation of lines, wrinkles and looseness in skin and also diffuses melanin deposition which causes dark spots and dark circles. 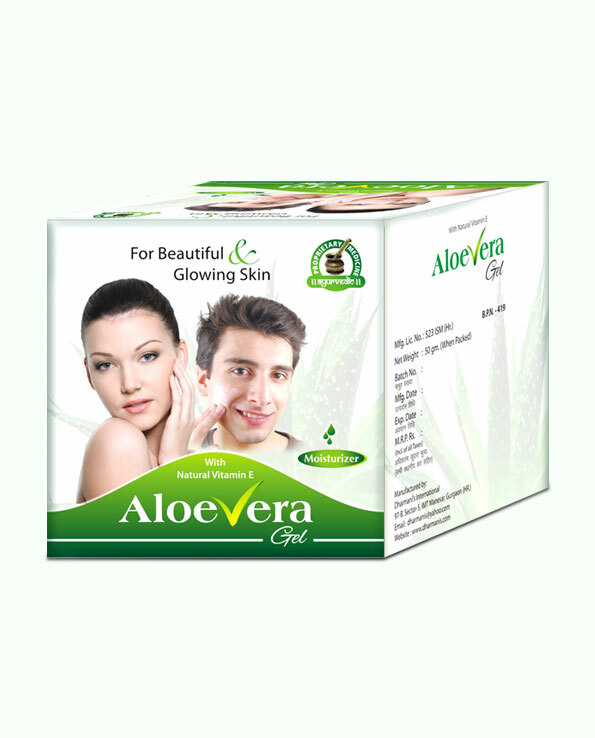 Herbal pure Aloe Vera gel also promote growth in connective tissues of skin, these tissues keep skin tight and flexible and also lighten or remove scars formed due to injuries, surgeries or acne. Herbal pure Aloe Vera gel is most effective sunscreen lotion. It has potent properties to repel UV rays present in sunlight which cause skin dryness and darkening. This ayurvedic cream for dry skin protects skin’s moisture and work as the best herbal skin moisturizing cream. Herbal pure Aloe Vera gel is not only wonderful supplement for treating dry skin but it also work as powerful natural supplement for oily skin. People have excessive sebum secretion due to overactive sebaceous glands and suffer with dark dull skin and numerous skin conditions. Herbal pure Aloe Vera gel has properties which promote healthy sebaceous glands and curb their over-activity to prevent oily skin conditions. By supplementing nutrients and minerals it keeps skin’s immunity higher and fights back skin infections and allergies. All round effects of this herbal skin moisturizing cream keep skin radiant, tight and supple and fight back all signs of ageing by providing clear and blemish-free skin. Is this cream safe to use? Aloe Vera cream contain pure and fresh Aloe Vera gel as main ingredient, it does not contain any artificial or synthetic material which may cause side effects. This cream can be used regularly and works far better than expensive cosmetic creams and gels. It sustains skin’s natural shine and suppleness and fights back signs of ageing; on regular use it improves skin’s tone, tightness and radiance considerably. What are the ingredients of this cream? Aloe Vera cream contains Aloe Vera gel as main ingredients and natural antioxidants and nutrients. This cream during production passes through various quality checks which makes it safe and highly effective. People who stay out in the Sun, get little time for skin care, and lead a strenuous lifestyle can easily gain shinier, clearer, smooth and supple skin with ease. How to use this cream? Wash your face with water and soap and wipe it dry, apply a thick layer of Aloe Vera cream and massage it gently for few minutes. Leave the cream on face and repeat twice in a day. You can apply one more time at night and let it stay till morning to gain younger looking shiny and blemish-free skin. If you suffer with oily skin or acne, wash face with lukewarm water and soap before applying Aloe Vera cream. How long do I need to take this cream for complete relief? We would suggest that you use Aloe Vera cream regularly in place of any cosmetic moisturizer to stay free from signs of ageing and keep skin youthfully radiant and supple. If you are noticing signs of ageing use this cream for 4 months but if you are suffering with acne or have spots or scars on face we would recommend use for 6 months to gain complete relief. Consume fruits and vegetables more in your diet and avoid foods which are high on fat or heavy on your stomach. Also avoid beverages, soda drinks and canned fruit juices or caffeinated drinks. Yes you can pay us on delivery in India. You can pay us through cheque, DD, cash deposit or NEFT as well. We ship our products through FedEx. You will get your order within 3 to 5 days anywhere in India, we maintain your privacy at each step and parcel will be hand-delivered to you in a discreet packing. I struggle with pigmentation, hence the dark spots – not acne related. This is the only product that helped me. I can see my dark spots fading away and over all skin looks glowing. I am using Aloe Vera Gel from last 1 year. And now I don’t have single mark of acne. My skin is glowing. It is awesome and natural. Bought this for my sister!! She says it is producing the glow on her face as well as controlling the pimples. AWESOME!! This is an absolutely wonderful product. I loved it. This product is worth the money. I will suggest this to all my friends. This product is amazing to make skin glowing and refreshing. It works well to remove pimples and acne. Those who are frustrated by acne give a try. Can it remove acne marks and redness on face or under skin acne marks? We all know about the goodness of Aloe Vera gel, but it is difficult to find pure Aloe Vera gel everywhere. It made easy for me to use the extract of Aloe Vera on face and it is amazing. Thanks! I use this gel on my face and felt difference, and its results are remarkable. Best one.